One of the best things about loving pop music is that it is almost impossible to name your most favourite pop song. I think that when we think of our favourite songs the list becomes dozens very quickly. A pop song will always remind us of a place, a person or simply a time in our lives and that is the wonderful power of pop music. That is why when we listen to the radio while buying something in a store, on a bus trip or in a club and we hear a certain song, all sorts of feelings and memories are brought back. A favourite song is one that you haven't tired of hearing yet and that you know in 10, 20 years you will love it, own it in your heart. Next year, a song that I know I will always love; "On the Radio" by Donna Summer, will be 30 years old, though it was a year later in 1980 that it was a Billboard top ten hit. I was ten years old when the song came out and as readers to this site know, I grew up with a radio station in my family's back garden, songs by artists like Donna Summer were heard on a daily basis. Around that time Donna also was singing songs like "She Works Hard for the Money", "Dim All The lights" and "Sunset People" which are my other favourite songs by her. "Dinner with Gershwin", a later perfect pop song, was a single I played on my radio show years later. "On The Radio" is a disco song but it is a ballad sung as a dance song. It's lyrics are that of a love song, it is a story song. The first line begins "Someone found a letter you wrote me" and then immediately; the great twist, as the three words of the song title are sung: "On The Radio". The love letter, the most private of communications, was read on the air, on the radio. "And they told the world just how you felt". Of course the entire world wasn't listening to the same American radio station but to the singer of the song they might as well have been. "It must have fallen out of a hole in your old brown overcoat" as she imagines how the letter came to be found by the "someone" on a street or in a city park. "They never said your name but I knew just who they meant" concludes, what I think, is one of the most memorable verses in pop music history. It is of course the production by Giorgio Moroder, the song's co-writer with Donna, that makes the song what it is. But it is of course Donna's voice that makes the song timeless. It has been sung on many an "X Factor" type show and was a hit a few years ago for Martine McCutcheon, who did a fairly faithful dance pop version of it. It has been recorded also by Emmylou Harris which I haven't heard but if anyone has a link to it I would love to hear it. "On The Radio" sums up the theme of almost half of the pop songs that would make up the 1980's with the lyric "The only thing that I want to hear is that you love me still and that you think you'll be coming home real soon". "On The Radio" was recorded as part of the soundtrack of the film "Foxes", something I never knew before the days of Wikipedia and because of that it was never part of a studio album and has instead been on various best of albums by Donna. 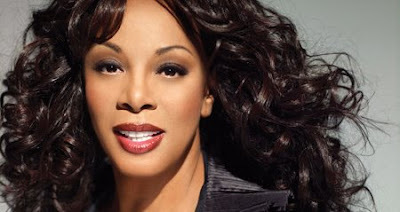 On New Year's Eve of this year Donna Summer will be 60 years old.